Hook Auction for the Ville!!! All of us "indies" (independent business folk) are SOOO appreciative of the new policy that allows us to advertise and freely discuss our crochet related businesses here in the Ville! So what I'd like to do back is support the Ville by donating the winning bid amount for this hook directly to the Ville. 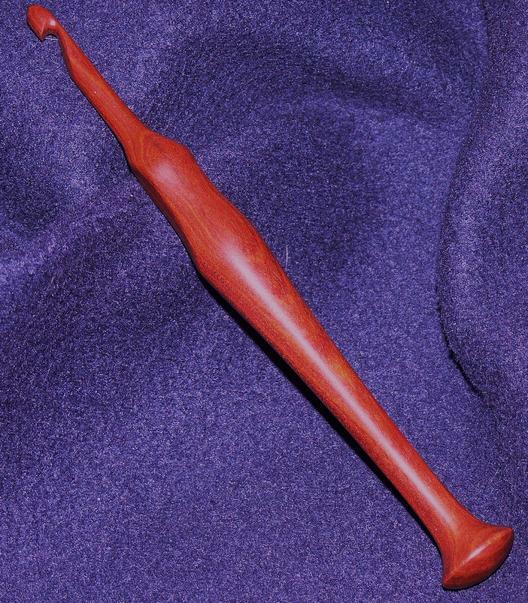 The hook in the attached picture is made of a REALLY beautiful Red Heart wood, and is a size J (6mm). It's 7 inches long and light as a feather yet strong. Now here's the deal. You can bid on this hook right here in this thread! Please keep bid increases at $5 minimum and consider while bidding that you're getting a very nice hook while at the same time supporting our Village! The auction maybe should run for a week, so lets end it Monday April 12 at 2pm Pacific Time. High bidder will be able to pay directly to Crochetville through paypal or whatever payment method is acceptable to Amy and Donna. Fantastic you guys!! Any questions about this, especially since it's a new venture, please post them here. I've subscribed to the thread and should be able to get back to you asap. Wow, what a great idea! Thanks, Jimbo! I'll go for $40.00 - its time to make a donation to the Ville and if I win, I can't decide if I will keep this beautiful hook or gift it to someone - decisions decisions decisions!!! What a beautiful hook!! Thank you so much for your support, Jimbo! You're VERY welcome, Donna! I'm liking how this is working so far and will probably be doing this again. Jimbo, thank you for thinking of this! I won your H hook in the last Crochetville auction and I treasure it. It's also time for a donation from me. Woooo hoooo!! We're doing great!! Holey COW!! I forgot the auction ended on Monday!! Skysmom was the high bidder and gets the hook. Skysmom, all you need do is make your payment directly to the Ville and let me know by pm or email where to send the hook! This was fun. I think I'll do it again soon. Wow, sorry I missed this one, hope you do another auction soon..... may I suggest an I hook! Jimbo, what a great way to support the ville and spread some cheer at the same time, Thanks! Yay! I'd missed seeing the deadline in your first post and kept thinking someone would go higher. I can't wait to see it in person. Thank you, Jimbo. You're VERY welcome, and thank YOU for your high bid! Hope the hook makes many and wonderous things for you. Oh and Mrs. Principal, if I can remember, the next one up will be an I.
and thanks again all you bidders! I missed this post, but I will be lurking for the next one. Jimbo you are the best. Many thanks to Jimbo for making this hook and doing this auction! Many thanks to each and every one of you who bid! Many thanks and congratulations to Skysmom for the winning bid! You're VERY welcome, Donna! Every little bit helps eh? Hope to do this again soon. Every little bit helps eh? Hope to do this again soon. My new Jimbo hook arrived today and it is absolutely gorgeous. I can't wait to start using it. Oh good!! I'm glad it got there ok and that you like it. Hope it makes lots of nice things for you! Next up... well it WAS going to be an I, but I just had this idea and just HAD to try it out. I'll post a new auction soon. The last post in this thread (the one above mine) has been reported. Why would you report Jimbo? Whatever could he have done? His auction was even to help the 'Ville. He makes wonderful hooks (I have two that I LOVE!) and has always been a good member here.